It is common to see sub-adult grizzly siblings together on the Grizzly Bear Lodge’s bear tours. Depending on food abundance, mother grizzlies may keep their yearlings a second (even a third) year, denning together again and breaking up in the third (or fourth) year. Alone and vulnerable, siblings will often stay together for some time after their mother abandons them, eating and sleeping side-by-side, and even denning together. The average breeding age for female grizzlies is 4.5 years. Males reach sexual maturity at roughly the same age as their female counterparts. Even though males are capable of breeding at three or four years of age, they rarely have the opportunity to do so because of intense competition from older, bigger males. 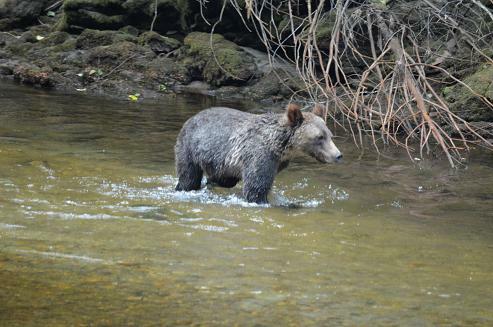 These two bears spent most of the summer in the area of the Glendale River. This photo was taken two weeks after the posting on October 28th and these two cubs are still fighting. 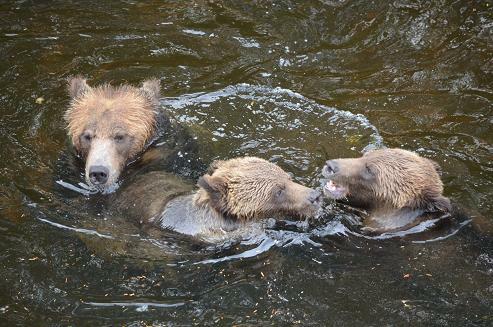 We observed these three bears throughout the summer on our grizzly bear watching days on the Glendale River and the family feud was part of their daily activity. This photo was taken from above from the viewing stands, which we use after August 24th, while the photo posted on the 28th was from a boat on the lower river. The location is not important the entertainment value of these bears make the guests stay more enjoyable. One method of feeding we often see with humpback whales is “Lunge Feeding”. The whale will lunge through a shoal of prey with mouth gaping open often exploding at the surface with both food and water. 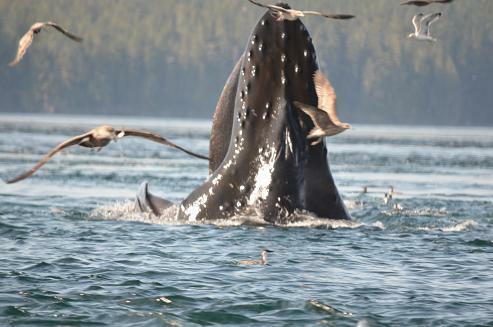 In this case the photo shows the top of the humpback’s head with its lower jaw hanging open. Humpback whales do not feed in the warmer climates of Hawaii and Mexico where they spend the winter so it makes sense that once they arrive in their feeding grounds, this will occupy most of their time. Humpback whales in our area will feed small, shoaling fish such as herring. They may eat up to 1,400 kg (3,000 lbs.) of food a day. A mother grizzly is never far away from her cubs as the leg in the top left corner of this picture shows. Triplets are always a challenge and these first year cubs spent this summer keeping their mother on the run. 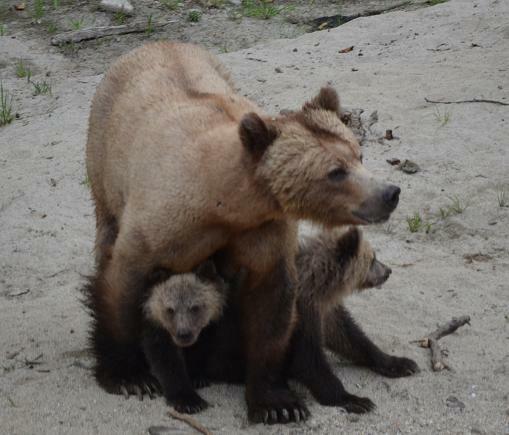 But whenever there was another bear in the area the cubs immediately returned to mom to make sure all is ok. Grizzlies with cubs are common in the viewing area used by Grizzly Bear Lodge. We are more likely to see mother grizzlies with twins, triplets and this year quadruplets than we are a bear with one cub. As with most wildlife viewing the best approach is often to sit and wait. On this particular whale watching tour from Grizzly Bear Lodge we arrived at the area of Johnstone Strait to start looking for orca and immediately located a pod of orca traveling along the shore. 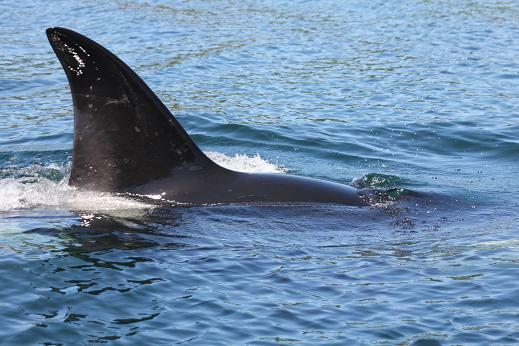 We stopped our boat, got out the cameras and let the orca come to us. As a guide for the lodge this is the best way to start a days trip and after some time with the orca we went on to watch stellar sealions, humpback whales lunge feeding, harbour seals, eagles and a few dall’s porpoise. All in all a full day. 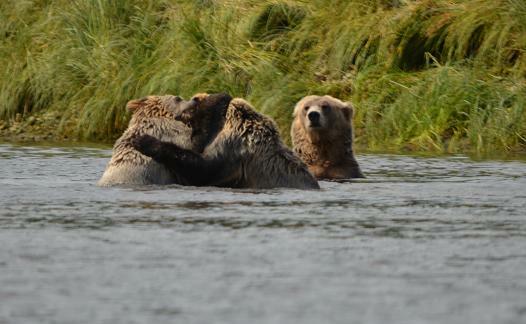 Spring and early summer grizzly bear tours from Grizzly Bear Lodge take place in Knight Inlet’s Glendale River estuary. This is a one hour and fifteen minute boat ride and then a transfer to a large skiff, which allows us to go into the shallow river to view the grizzlies. It is like a scene from the old movie “African Queen” with your guide in waders pulling the skiff up the river and often finding a grizzly walking along the river. If the river is wide we pull to one side to allow the bear to pass if it is narrow we back down the river either way there is opportunity for great photos. 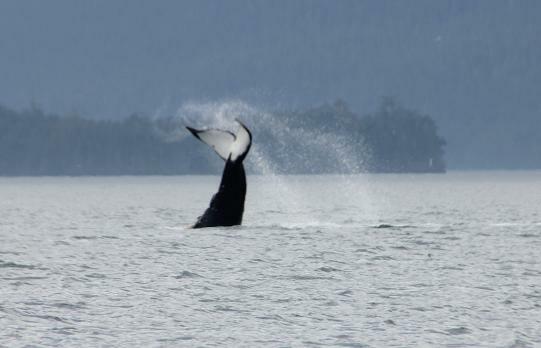 While on a whale watching tour from Grizzly Bear Lodge we came upon a humpback whale tail lobbing or lobtailing. Lobtailing is the act of a whale lifting its fluke (tail) out of the water and then bringing it down onto the surface of the water hard and fast in order to make a loud slap. In this picture it is an upside down lobbing where the top of the tail is hitting the surface so the whale is on its back. If you compare photos this is the same humpback from the Oct 18th posting. In this case a guest counted 38 consecutive slaps that is a lot of energy expelled and no one is sure why. 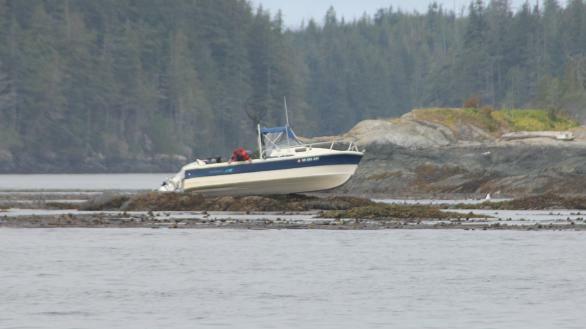 This is what a guide calls “Job security”. When guest see this they are glad they are with a guide. To be fair this was a foggy morning and it is possible to pass close to this island just not on the side chosen by this driver. To give you confidence the guides at Grizzly Bear Lodge have each been working in the area for more than fifteen years. 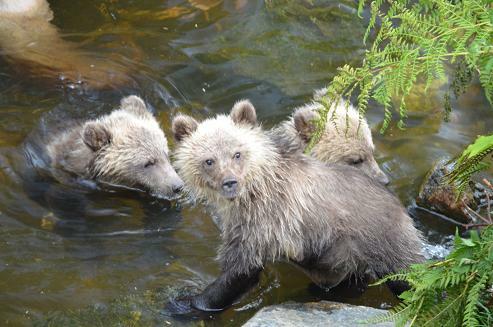 As soon grizzly cubs sense any kind of danger they run to mother for protection. 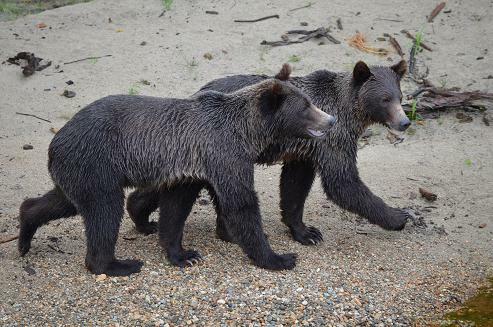 In the spring cubs are appear along the shore of Knight Inlet in late May and we are able to watch their growth through to October prior to the closing of Grizzly Bear Lodge in mid-month. 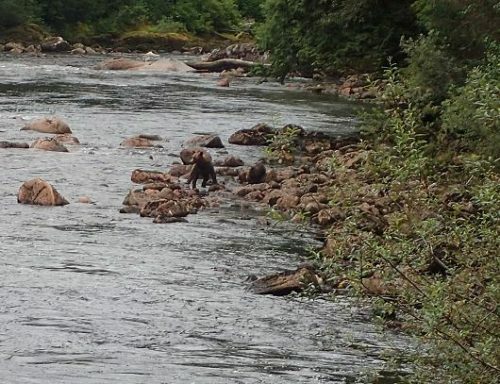 This photo was taken in September from the viewing stands as the mother grizzly watched a second mother with two-year-old cub’s approach the salmon fishing area. All ended well and they all continued to catch and eat fish.